A weekend of gastronomic delights in Alderley Edge culminated on Sunday, with lunch at The Merlin, which bills itself as a pub, but pleasantly surprised us by being more than a cut above your usual Sunday lunch pub restaurant. A large, imposing building just outside the town, it is lavishly furnished with unusual items such as a chandelier constructed from wine glasses, and pony skin upholstered seats in the restaurant area. As soon as we arrived, we knew we were going to enjoy the experience. 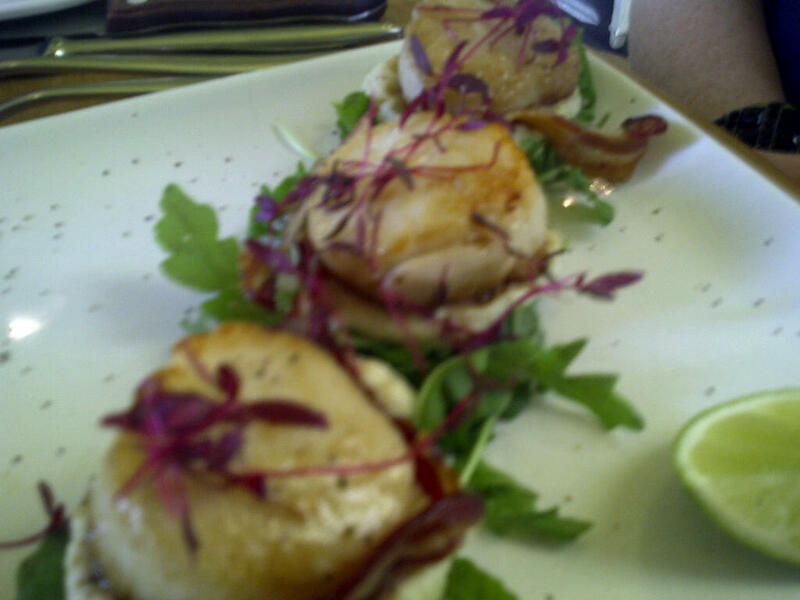 The menu is described as modern British with a Mediterranean influence. The ‘regular’ menu was very extensive, with a huge variety of meat, fish and pasta dishes, plus a selection of pizzas and a number of salads. Some of the salads and pasta options were available in a starter or main course portion, making the range of options even more mind boggling, especially for someone as indecisive as me when it comes to dining! On top of this, there was a special Sunday menu, with several more meat and fish specials, plus three traditional roasts to choose from. Although none of us opted for a roast, we saw plenty of these being served (they were more cheaply priced than most of the main dishes) and the giant Yorkshire puddings looked particularly tempting! 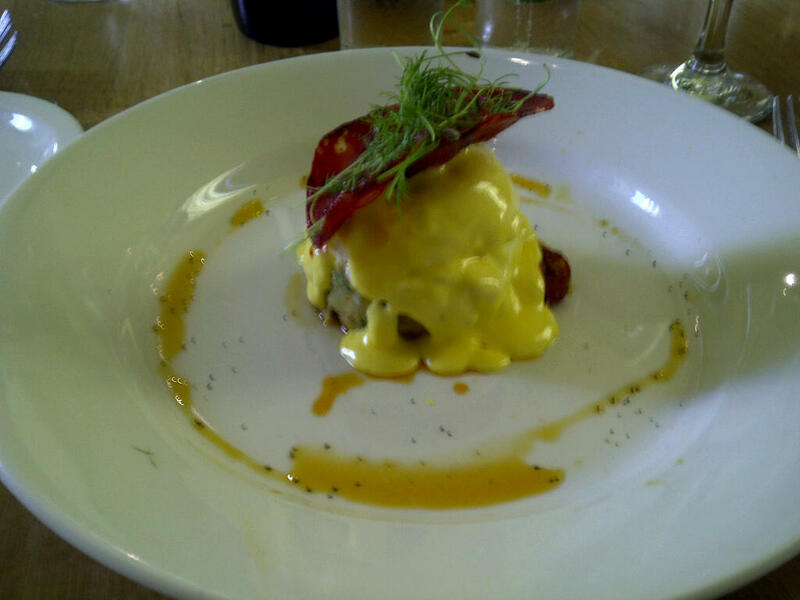 To start, I chose a chorizo and potato hash, served with a poached egg and hollandaise. This was fantastic – soft potato contrasting with generous chunks of spicy chorizo and a perfect poached egg, plus creamy hollandaise. 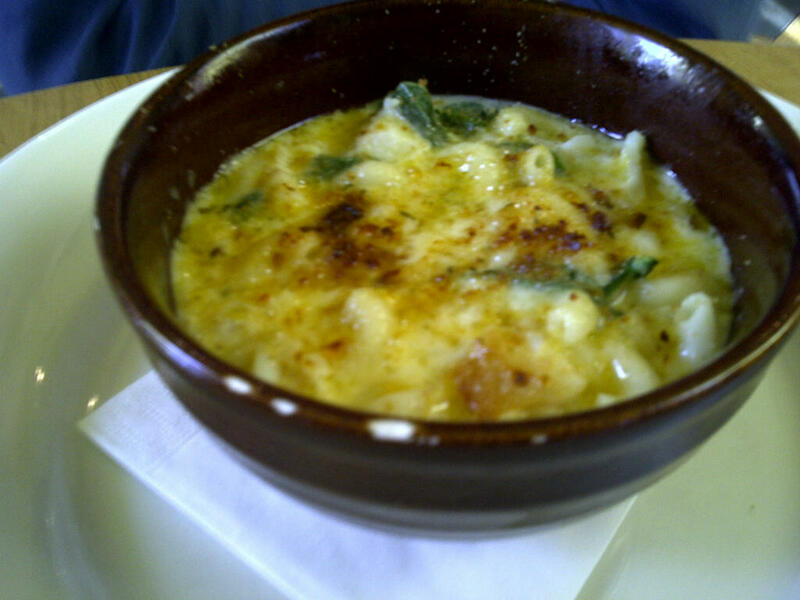 Mr W had a whole roast quail with a mustard sauce, and our friends had scallops with cauliflower puree, and a starter portion of one of the pasta dishes: namely macaroni cheese with smoked haddock and spinach, made with Applewood cheddar. All of these were excellent and the latter two had been serious contenders for my own starter choice. My main course was a bit of a disappointment, which was a shame as I’d been very indecisive and had wavered over a number of different options before taking a risk (which I regretted in the end!) 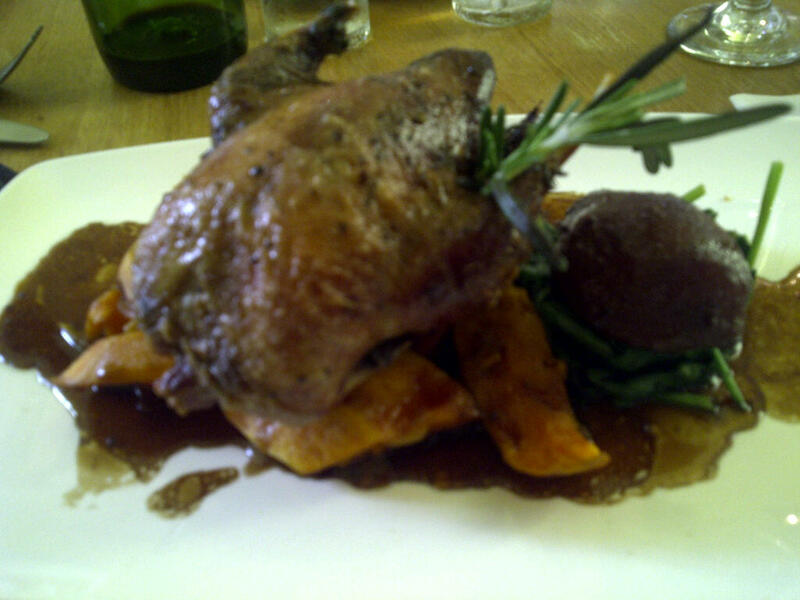 and going for a whole roast partridge, served with a poached pear, sweet potato, spinach and a red wine jus. Unfortunately, the partridge was overcooked and very dry – the taste was there, but the texture wasn’t good – it was almost offally in places as it was so dry and dense, although combining it with a mouthful of the poached pear (which was lovely) did help it along a bit. We asked for some more red wine jus (the serving it came with was not overly generous) in the hope that this would make it more edible, but unfortunately we waited ages for this to come, by which point I felt I’d eaten enough and wasn’t keen to have any more. The accompaniments were very good, though, and the staff were apologetic, asked if I’d like something else instead, and then took the dish off the bill for us, without our having to ask them to do so. I certainly drew the short straw, as everyone else’s mains were very enjoyable. 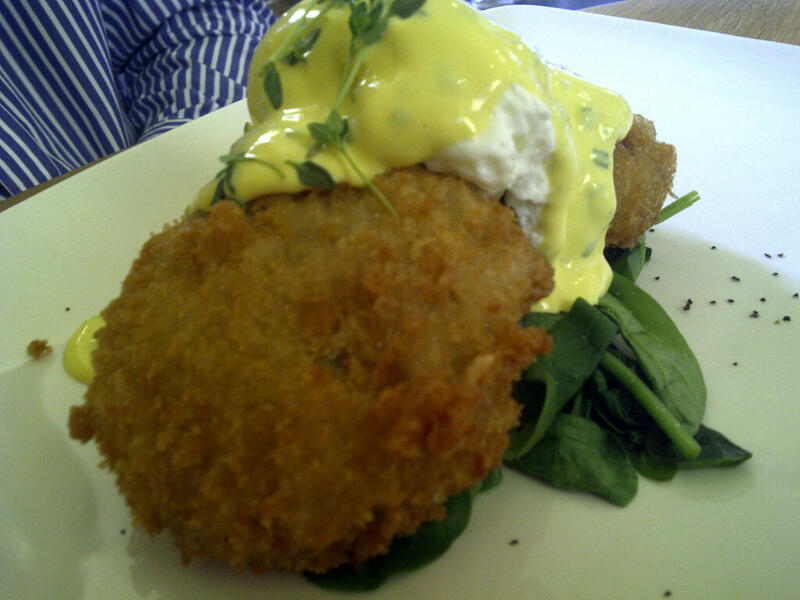 Mr W’s in particular was fantastic: salmon and caper fish cakes, served with a poached egg and chive hollandaise with wilted spinach, which he had with a portion of chips on the side. The fish cakes were tasty, packed with fish (unlike some which are predominantly potato) and beautifully presented too. 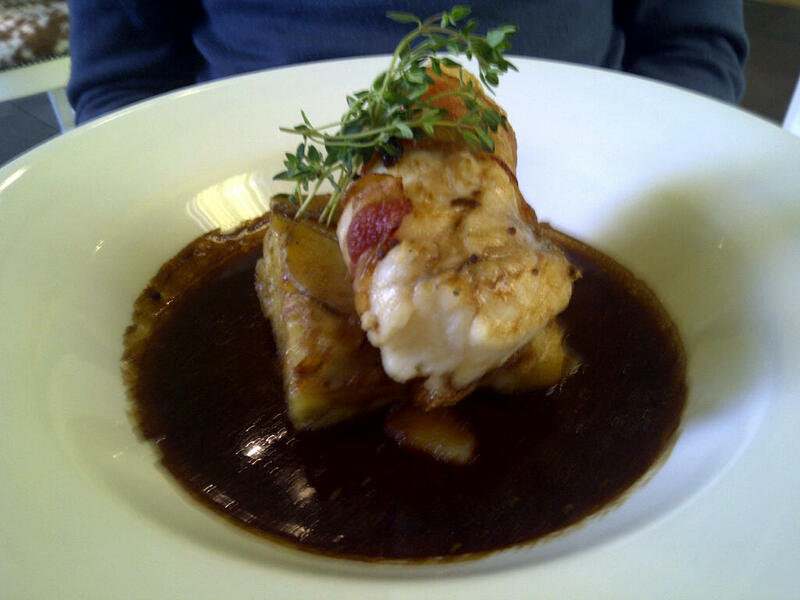 Our friends chose monkfish wrapped in ham, and a braised short rib of beef served with a Lea and Perrin’s glaze, bubble and squeak and crispy fried onions. Both of these looked excellent and went down very well. One of our friends is a massive fan of Brussells sprouts (she also loves liver – don’t hold it against her!) so she ordered a side portion of Brussells sprout and parmesan gratin, which apparently was very good indeed. Mr W and I shared a pudding of apple and blackcurrant crumble with custard. It was refreshingly sharp and fruity, with just the right amount of crunchy crumble topping and a generous helping of proper custard – a fitting end to a hearty Sunday lunch. 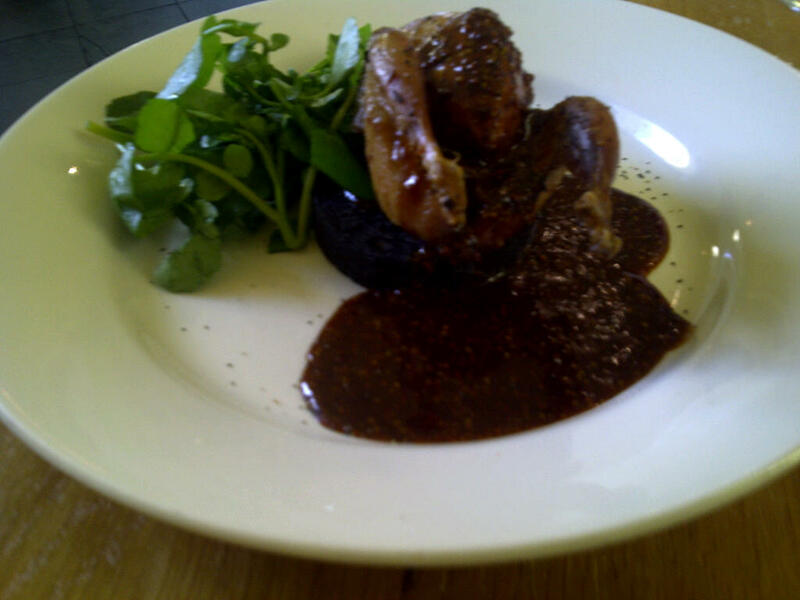 The service was friendly and enthusiastic and generally attentive – it was just unfortunate that my extra red wine jus took too long to come along, but the situation was certainly redeemed by the staff’s subsequent actions. For two and a bit courses each (minus the cost of my main, which was one of the higher priced dishes at around £18), plus coffees and a few bottles of wine, the bill came in at around £35 per head – not cheap, but quite reasonable for the standard of the food, the dining experience, and the sheer variety of tempting dishes on offer. 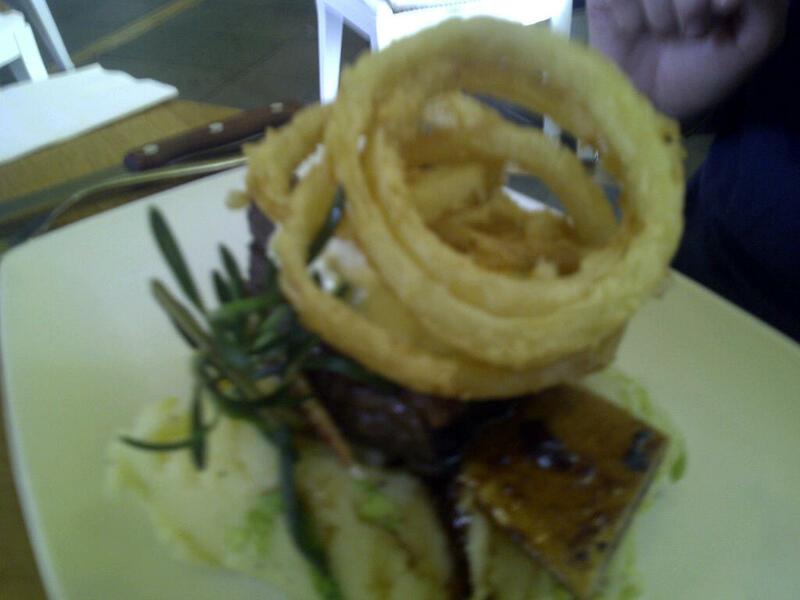 Despite my disappointing main course, on the whole we thoroughly enjoyed our meal and would certainly go back to The Merlin for Sunday lunch if we were in the area again.